Now in our third generation of family ownership, Ella Baché boasts the country’s largest skincare franchise network and our products and services are available in over 150 salons nationwide. There’s no secret to our enduring success. Our brand reflects the traits Australians tend to value and admire most, like authenticity, curiosity, hard work and confidence. We’re also a family – we take care of each other. As a franchise owner, you can expect the ongoing support and training you need to create the vibrant lifestyle you want. Be part of the most established and respected skincare brand in Australia. Experience our proven franchise model. Benefit from our ongoing commitment to product research, development and education. Bring your salon to life with our in-house Interior design support. We’re by your side with ongoing marketing guidance, business development advice and training. Own the only salon in your territory. Endless opportunities to learn through Ella Baché College. We are looking for business savvy people who are passionate about superior skin care and know how to deliver an outstanding customer experience. 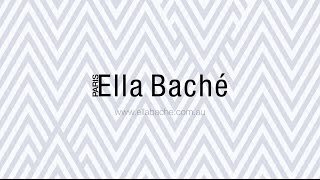 A desire to be in business for yourself but not by yourself will drive the right franchise relationship of guidance and support while upholding the Ella Bache brand promise to our clients from coast to coast. While many of our franchise owners are qualified beauty therapists, a number are not. What unifies them is a belief in our philosophy, a readiness to learn, and a positive can-do attitude to succeed. We’ll give your salon a strong start and all the support it needs to thrive. Your success is our success, so we’ll provide an array of market leading tools, resources and services to give you a boost wherever you need it. We help our franchisees leverage the strength of our brand, products and services with comprehensive marketing support, including: brand awareness campaigns, monthly promotional plans, localised marketing material, social media tool kits, cooperative advertising and generous rebate programs. An easy to access online location for all franchisee services, online resources and business management tools, including manuals, advertising templates, image libraries, training videos and more. We provide a rebate to our salon owners for online sales and we also direct customers into salons post-purchase. We love to see Skin Therapists, salon teams and salon owners glow with pride when they’re recognised for their outstanding achievements as part of our national incentive programs. Our annual ‘Ella Awards’ is a glamorous event that applauds the performance of top salons and selects individuals in each state for their performance and commitment. Learn how fellow salon owners have managed similar circumstances and share your solutions to help your peers grow. These strategic alliances are offered formally (in group sessions) or one-on-one, if requested. Salon owners attend an annual conference to acquire business tools to improve your operational efficiency, ideas to inspire business development and opportunities for professional growth through networking. Communication is key to maintaining a healthy and constructive relationship with our salon owners. Through the Council, we actively seek out ways to improve the transfer of information and promote all the support that’s available to you. You and your team will receive five days of training and coaching prior to your opening, and you will also receive ongoing support in your first two weeks from your business manager and field trainer. You and your team will also have access to regular training that focuses on each individual’s needs to help your business perform at its best. The Ella Baché College of Skin & Beauty Therapy has been among the most highly respected education providers of its kind in the world for over 50 years. It is also an invaluable asset to our salon owners in fulfilling their salon staffing requirements. We provide you with a dedicated Business Development Manager to give you ongoing support and training, as well as business coaching, planning support and guidance of how to effectively market your salon. Your targets will be easier to meet and your business will be easier to manage with their continued motivational support and advice. To find out if becoming at Ella Baché salon owner is your path to an exciting new future, simply follow the process below. 1. Send an enquiry to our franchising team or contact our Business Development Manager on 1300 136 661. We’ll assess your details and give you some more information about the business and our franchising offer. 2. Applicants who are interested and a fit with our criteria are invited to an obligation-free 1:1 meeting with a business development manager. We’ll answer any questions you have and get to know you better. 3. A refundable deposit of $1,000 is required to progress to agreement stage. 4. Our team will help you understand all the considerations and opportunities that come with being an Ella Baché salon owner, and introduce you to the benefits that come with becoming part of the family. 5. You’ll take the time to obtain legal advice, organise your finances, and meet with an existing franchise owner at their salon to gain a real-world view of salon life. 6. We’ll help you find your ideal site and ensure you have all the skills, tools and support you need to open and operate your salon with confidence. What costs are involved for Ella Bache franchisees?